Turning on its head that familiar "woman question," this innovative work poses masculinity as a problem that requires explanation. Ferguson rebukes the sense of coherence contained in patriarchal theory in the name of a voice that both calls upon and challenges the category woman. Stepping back from the opposition of male and female, she artfully loosens the hold of gender on life and meaning, creating and at the same time deconstructing a women's point of view. 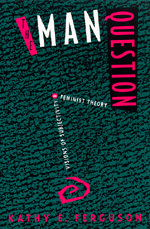 Posing the "man question" provides a way not only to view male power and female subordination but also to valorize and problematize women's experiences, thus destabilizing conventional notions of man and woman. Kathy E. Ferguson is Associate Professor of Political Science and Women's Studies at the University of Hawai'i, and author of The Feminist Case Against Bureaucracy and Self, Society and Womankind: The Dialectic of Liberation.